I've been in Italy for almost 6 months now. One of my favorite things is to discover new foods. Sicily had the best! But Tuscany is growing on me. I actually love wandering the aisles at grocery stores because "stuff" is SO different. Italian pizza is the best followed by pasta (obviously), gelato rules, calamari is pretty top notch, and cheeeeese. These are the unhealthier options *eye roll* But the fresh veggies, fruits, and poultry wins my heart too. Spaghetti w/Meatballs ~ NOPE!! If you try to order in Italy, you'll get laughed all the way back to America. It's a 100% American made up meal. Spaghetti, yes. Meatballs, yes. Together, never! Marinara Sauce ~ Yes and No... it's actually called sugo di pomodoro, never marinara and it's way more simple than the marinara (which means 'in the style of the sailor') that you know and love. Garlic Bread ~ NOPE!! Did you fall off your chair!? I was appalled when I first moved here. You'll get bread at your table for practically every meal but it's just plain ol' bread. No cheese. No garlic. Not toasted. Sorry friends! If you want anything like garlic bread, you order bruschetta. Italian Dressing ~ NOPE!! Heartbreaking isn't it? I cry almost every time I eat salad. The sadder part, there's not even a recipe to make it happen. Trust me, I've tried. Italian dressing is actually from Missouri. The closest you'll come here, oil and vinegar. Fettuccine Alfredo ~ Yes and No... invented at a restaurant in Rome, Italy, it's absolutely unheard of in Italy. In fact, Luca has never tried it in his life. Chicken Parmigiana ~ No. Sicilians love eggplant parm (and so do I) but sadly, chicken (and veal) parm cannot be found... it's American! Sausage, Peppers, and Onions ~ No. Especially sandwich style w/focaccia. It's made in my house, but not other houses in Italy. Nor on menus. Sausage is more commonly served with potatoes or solo as your second plate. Peppers and onions are commonly a side dish or nonexistent. And 'salami' is not pepperoni nor any meat close. Baked Ziti ~ No. While you'll find some Italian families baking their pasta dishes, this one is an American-Italian staple, not Italian. Penne all Vodka ~ No. This was technically (possibly) invented in Italy, but you won't find it on any menus. They think it originated accidentally by a drunk chef. Ha! Shrimp Scampi ~ No. Potentially invented by Olive Garden, not Italians. Italians would never use butter as a sauce. Olive oil? Yes. Cream cheese? Yes. Butter, noooo. Cioppino ~ No. San Fransisco invented by an Italian-American fisherman. Muffuletta ~ No. Inspired by Sicilians but 100% New Orleans. Neapolitan Ice Cream ~ No. Named after an Italian-immigrant run ice cream shop in America. Pizza Pockets ~ No. Unless you call them calzones. No sauce inside. And they're usually the size of our head. Mozzarella Sticks ~ No. Very American. The only link to Italy is the mozzarella cheese. But you'll want that fresh here, not fried. Italian Wedding Soup ~ No. Ironic to the name, you won't find this soup anywhere. You will rarely see bolognese sauce (meat sauce) served with spaghetti noodles. They're more likely to be served w/tube pastas. You will rarely see chicken tossed with pasta (or any meat). You will rarely see dough w/butter, garlic, or other fancy ingredients. Dough is simple: flour, water, salt, yeast. Some add olive oil. Focaccia however, the sky's the limit! I like rosemary and black olives. You will rarely see parmesan or chili flakes on pizza or pasta. Nor will they come to your table to shave it fresh all over your meal (i.e. Olive Garden). Okay okay, enough secrets revealed. I'll leave you with this... if it's made in Italy using Italian ingredients, but by an American chef... is it Italian? Or American? p.s. the dish pictured? 100% Italian!! 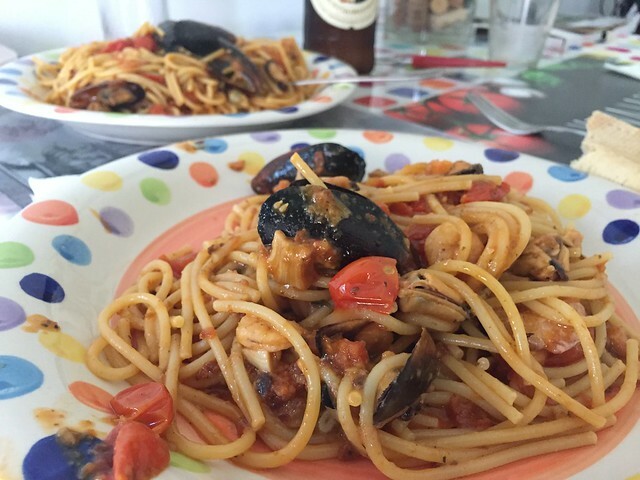 Seafood pasta is very common and one of our favorites. This one was prepared by Luca!